Ever since man first attempted to back a horseless carriage up to the coupler of a trailer, he has been trying to devise an easier way to make tow ball and coupler come together in harmony. Wives have used hand gestures in futility, convex mirrors have been mounted on trailer tongues to reflect a view of the tow ball to the driver, “V” shaped deflectors have been mounted on bumpers in the hopes of guiding the coupler over the ball, verbal instructions between spouses via two-way radios have led to division, and even tennis balls mounted on fiberglass rods have been employed to solve this age-old problem. The digital age, which has made life easier in many other of life’s arenas, has also solved the problem of hooking up a trailer. Relatively inexpensive (as compared to radios, damaged bumpers/tailgates, and broken marriages), back up cameras are now available to RVers everywhere. There are two basic varieties: wired and wireless. The camera on wired varieties is attached via your license plate frame mounts, with power being supplied by your vehicle’s back up lights. The camera on wireless systems is powered by alkaline batteries and attaches (temporarily) magnetically to your vehicle. 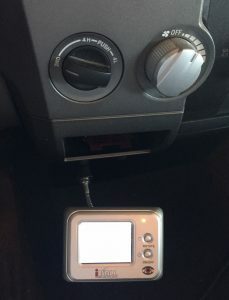 With either variety, the video screen viewed by the driver is powered by the 12-volt outlet in the vehicle’s dash. The screen can also be programmed to rotate the image on the screen so you don’t have to reverse what is left and right in your mind as you back up. Now hooking up is a breeze – just turn on the camera and guide the tow ball under the coupler with no fuss or confusing hand signals from your significant other. 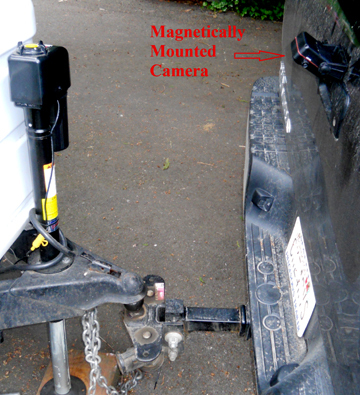 An added advantage of the wireless camera is they can also be “stuck” on the steel bumper of travel trailers to view what is behind your rig as you back into tight campsites. There are lots of highly reviewed cameras on the market. A few popular favorites include Rear View Safety (RVS) Camera, the wireless camera from Camecho, the smart hitch camera system from Hopkins, and the wireless & waterproof camera from Podofo. Hooking onto your travel trailer without the fear of damaging your rig or marriage – just another adventure in RVing! I have a $3 solution to this problem, for hooking up my fifth wheel, I got a magnetic tool retrieval device with a telescoping handle. I placed it on the floor of my tow vehicle centered with the fifth wheel. When I was ready to hook up, I reached over into the bed and pulled up the telescoping handle so that it was visible in my rearview mirror and then just baked up keeping the handle centered on the pin box in my rearview mirror. After hooking up I just pushed the telescoping handle back down and left the device on the floor until the next time I needed it.